Douglas-fir (Pseudotsuga menziesii) is North American conifer, first imported into New Zealand in the early 1900s. The area of Douglas-fir in New Zealand is currently around 104,000 hectares. 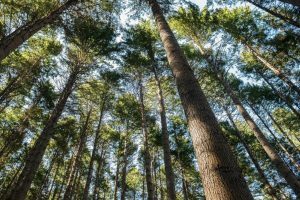 The New Zealand Douglas-fir industry has set a target of an additional 40,000 hectares by 2050. Douglas-fir Manual (Forest Research Bulletin No.237 ) J.Piers McLaren 2009. Best single introductory guide for growers. Includes an economic appraisal based on the Douglas-fir Calculator. Growing Douglas-fir NZFFA Information Leaflet 19. NZFFA 2005. A good, brief introduction. Douglas fir: FRI Bulletin No. 124 Introduced forest trees in NZ – Recognition, role and seed source. Part 14. NZ Forest Research Institute 1994. More detailed description from seed source to processing and timber properties. NZFFA website, Douglas-fir section. Tree Grower articles and other NZFFA resources on practical aspects of growing and milling Douglas-fir. 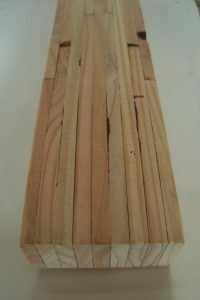 Douglas-fir section of the NZ Wood website NZ Wood. Good information on Douglas-fir timber properties and end uses. The NZ Douglas-fir Association Information on various aspects of growing and especially utilising, Douglas-fir timber. A breeding programme is underway, and priorities are improved volume production, improved wood quality, and improved tolerance to Swiss Needle Cast (SNC). A new generation of Douglas-fir seedlings has been established ready for field testing on three sites in 2018. Genomic selection work is also underway, which will lead to more rapid deployment of improved tree material. Growth targets: 35-year rotation length; 600m3 total recoverable volume (TRV) per hectare; 20m3 per hectare mean annual increment (MAI). Form to be maintained at 1996 progeny trial levels. Wood stiffness maintained at a minimum level of 8 GPa. Needle retention indicating tolerance to SNC is included as a secondary trait with a long-term target of 3 years’ needle retention. Sterile plants developed: this is being addressed in a separate Wildlings Management Programme which began in October 2016. The Douglas-fir industry is looking to improve the value of thinning logs, top logs and poorly formed clearfell logs. These logs are commonly small diameter , sometimes with poor form. The target is a $70/m3 increase in the value of these logs. A new ‘oriented engineered lumber’ technology, OEL™ , takes 1-metre long logs and produces structural products with known, uniform and reliable properties. The OEL™ process is owned by Wood Engineering Technology Ltd (WET): research into the new process is supported by the SWP. See the SWP Programme Description pages 10-12 for more information on current SWP research on Douglas-fir. Douglas-fir is a species which prefers cool, higher altitude conditions. It is well-suited to the southern South Island and cooler, wetter parts of the central North Island. It is the species of choice for high-elevation sites with winter snowfall. produces high-quality structural timber, which is generally more valuable by weight/volume than radiata pine timber. risk of wildings – Douglas-fir is a pioneer species with very light, easily dispersed seed which germinates readily outside plantation boundaries. The wilding trees threaten valuable landscapes and ecosystems, especially in the South Island high country, and there are now tight controls on new planting in some locations.